I will admit that this blog occasionally veers into hyperbole for dramatic effect or to illustrate a particular point. This is not one of those times, however. I am not exaggerating when I say that, having lost the 2012 elections entirely, the Republicans have decided to turn to economic terrorism to try to force their policies through the American political system, against the will of the American people. Let me rephrase that last sentence of his: "It's the only way to force through our extremely unpopular policies completely against the will of the electorate, who utterly rejected our policies in the 2012 election." Everyone in Washington, DC and in the news media right now is flipping out about the fiscal cliff - but in reality, the fiscal cliff isn't a huge deal. In fact, one year ago, I already predicted that going over the fiscal cliff (it wasn't called the fiscal cliff back then) wouldn't be such a bad thing and would almost certainly be better than whatever Congress came up with as an alternative. I think what I said a year ago still stands - going over the fiscal cliff will likely be a better medium- and long-term outcome than any proposed alternative that will be acceptable to the Republicans. 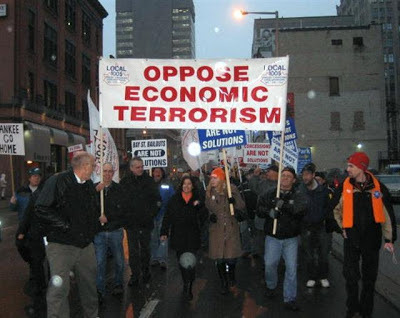 A MUCH BIGGER short-, medium-, and long-term problem is the Republicans' willingness to invoke economic terrorism (i.e. threatening not to raise the debt ceiling) to push through their policy agenda against the will of the American people as obviously expressed in the 2012 election. This is such a SELF-EVIDENTLY AND PROFOUNDLY STUPID IDEA that I barely have the ability to contain myself to type out a semi-intelligent response, as I'm pretty sure that even hearing an idea that stupid has lowered my intelligence - though only temporarily, I hope. Most of the "debt" and "deficit spending" that Boehner is complaining about was actually all caused by Republicans, not Democrats. This is such a dangerous idea, even business magazines have started running articles entitled, "IT'S OFFICIAL: The Whole World Thinks Republicans Are Dangerous Maniacs Threatening Everyone." Either way it plays out, this will lead to another recession, if not a depression, by either 1) hugely slashing government spending in a time of relatively low demand, or 2) throwing the entire financial system into utter chaos. The market is saying, as loudly as it possibly can, that the U.S. government should be borrowing and spending MORE, not less. It's very simple - the U.S. can borrow money at negative real interest rates. If investors thought that the U.S. was borrowing too much money, they'd be demanding a 7% interest rate (like they are for Spain), or a 30%+ interest rate, like they are for Greece. When investors start to think that the U.S. is borrowing too much, they'll start to demand higher interest rates; right now, they're not, so the government can (and should) borrow and spend more. The last time the Republicans did this, they earned the U.S. its first credit rating downgrade ever. Obama took an approval ratings hit, but Congress took a far bigger hit, and independents blamed most of the debacle on the Republicans. I find it hard to believe that it's wise for the Republicans to want to go through this again. So, the Republican Congress is yet again proving that it is full of crazy people and it's led by someone who's willing to act like a crazy person, even though I'm pretty Boehner isn't as dumb as he's currently acting. Exercise "the constitutional option," i.e. invoking Section 4 of the 14th Amendment, which says that “the validity of the public debt of the United States … shall not be questioned” and simply ignoring the debt ceiling altogether. Bill Clinton has said that this is what he would do, if he were in Obama's situation, though the Obama administration thus far seems to have ruled this option out. Preemptively sue Congress over the issue and force the Supreme Court to decide whether it's constitutional for Congress to pass budgets on the one hand and then refuse to pay for them on the other hand. On it's face, it's stupid that Congress is allowed to do that, and I'd hope that the Supreme Court would agree, but who knows - the Supreme Court has been making all kinds of bad, stupid decisions lately. Mint $1 trillion platinum coins. A little nuts, yes, but 100% legal. No matter what happens, this episode confirms the fact that one of the two major parties has been taken over by ideological extremists bent on imposing their policy agenda regardless of the harm they cause to the poor, the middle class, the elderly, the sick, the environment, and the American economy in general. And those aren't my words - they're the words of a conservative American Enterprise Institute scholar. Perhaps it was naïveté on my part, but I was hoping that the 2012 elections might have shown the Republicans that the American people don't want their policies, thereby making the Republicans less crazy and more willing to compromise. But no, if anything, the 2012 elections seem to have made the Republicans even more resolute to resort to economic terrorism to fulfill their policy agenda, because the American people are obviously too stupid to know what's good for them and they should just shut the hell up and let the Republicans do whatever they want even though they don't control very much of the government. Here's where things get even crazier - even if Obama wanted to agree to Republican demands, he can't - because the Republicans steadfastly refuse to say what they actually want. They really seem to expect for Obama to sit back and keep proposing things until he finally comes up with something they'll agree to, even though they won't say exactly what they want. Thus far, it seems like Obama has refused to play this game (thank God - perhaps this time will be different than past budget negotiations with the Republicans). Instead, Obama has taken a more traditional negotiating strategy, laying out his proposal (which pretty much matches exactly what he promised in his campaign, so it shouldn't come as a surprise to anyone) and waiting for the Republicans to make some kind of counter-offer. Instead, the Republicans are howling with indignation over ... I'm not sure what - Obama doing what he told everyone he'd do during the presidential campaign? To control costs, you have to, you know, control costs. But even as Republicans demand “entitlement reform”, they are dead set against anything like that. Bargaining over drug prices? Horrors! The Independent Payment Advisory Board? Death panels! They refuse to contemplate using approaches that have worked around the world; the only solution they will countenance is the solution that has never worked anywhere, namely, converting Medicare into an underfunded voucher system. So pay no attention when they talk about how much they hate deficits. If they were serious about deficits, they’d be willing to consider policies that might actually work; instead, they cling to free-market fantasies that have failed repeatedly in practice. But instead of talking about what really matters short-term (the debt ceiling) or long-term (health care costs), everyone is flipping out over the fiscal cliff. Well, I for one hope that if the Republicans again turn to economic terrorism when we next reach the debt ceiling, Obama this time has the balls to tell them, "You've passed two contradictory laws - the federal budget and the debt ceiling. Since I as the Executive have the Constitutional power and responsibility to implement the laws passed by Congress, I'm ignoring the debt ceiling law and obeying the federal budget law." And that will be that, I bet - though it will probably cost the U.S. more credit downgrades, which we will be able to firmly place at the feet of the Republicans. Labels: Apocalypse, Bad Ideas, Bubbles, Economics, Politics, Taxes, U.S.